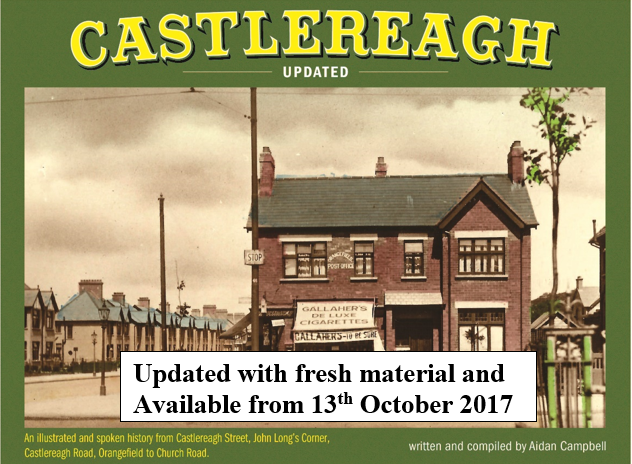 ‘Castlereagh Updated’ follows on from the publication of 12 local histories covering areas of East Belfast, 1 on South Belfast and 1 on Greater Belfast and is an update of an earlier book containing newly discovered photographic records and memories of how life has developed on the Castlereagh Road over the past century. Where does the Castlereagh Updated story begin and end in terms of this book? It involves a journey, including old photographs and reminiscences, which begins at Castlereagh Street, crosses the Beersbridge Road into Castlereagh Road and then travels to Ballygowan Road and Castlereagh Village. There are diversions to Loopland, Orangefield, Montgomery Road, Church Road, Manse Road and Lisnabreeny. There are views of big houses, small houses, businesses, factories, schooldays, community groups, social occasions, wartime, public transport including trams and trolleybuses and suburbia. Many of these scenes are remarkably unchanged and whilst some of the semi-rural character remains, many locations have been swept away and are unrecognizable following recent developments. At the junction with Albertbridge Road and Castlereagh Street this is a view of Mountpottinger Road in 1953 and the absence of road traffic (apart from the cyclists) is noticeable. 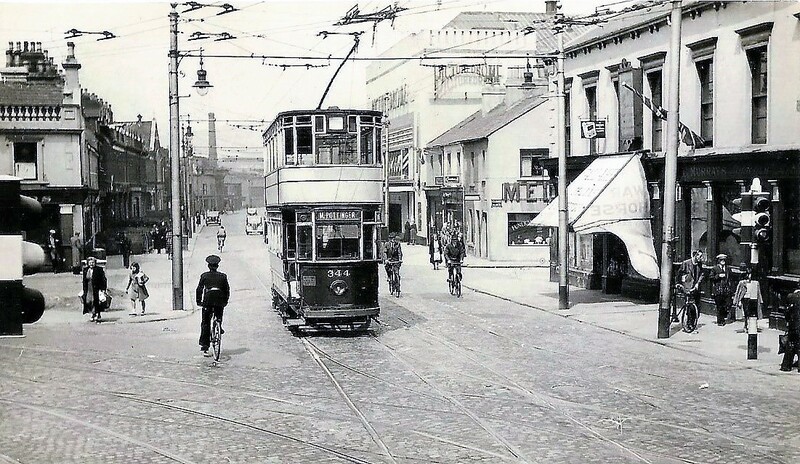 The tram is not very far from the Belfast City Tramways Mountpottinger Depot next to 102 Mountpottinger Road and just beyond the Picturedrome cinema now the location of Newmount Credit Union. The RUC constable following the tram (and riding the pursuit vehicle) is headed in the direction of the RUC Barracks at 64 Mountpottinger Road. Looks like Melville & Co, Undertakers have opened for business on the corner of Cluan Place and a Union Jack flag flies at the licensed premises to the right. The old Loopbridge Mill next to the Loop River was taken over by printers McCaw, Stevenson & Orr in 1894. It was renamed ‘Linenhall Works’ in 1896 after the original address of the business at Linenhall Street, Belfast. In those days this portion of Castlereagh Road was on the very outskirts of Belfast and considered to be ‘in the country’. This is how it looked in 1923 in water colour but all these buildings were recently demolished for the construction of a new Tesco supermarket. Interesting that the artist has omitted any signs of the electric tramway system which reached this part of the world in 1913 with a terminus in the vicinity of the present Houston Park. The trams were replaced by trolleybuses in 1941 and the end-of-lines was alongside the Clonduff Estate next to the Hillfoot Road. To mark the centenary of the Great Exhibition of 1851 it was decided that Britain, suffering the after-effects of the Second World War should celebrate the British way of life. The Festival of Britain was to be ‘a tonic to the nation’. Although the main venue for the Festival was to be a site on the South Bank of the River Thames in London, there were to be a number of regional exhibition centres including the Ulster Farm and Factory Exhibition staged at Montgomery Road, Belfast. The Belfast Exhibition at the Castlereagh site was opened to the public on 1st June 1951 and closed on 31st August 1951 with an attendance of 156,760 paying visitors – twice as many as originally estimated. The aim of the exhibition was to demonstrate the craftsmanship and productive skills of Northern Ireland’s factories and farms. The Festival buildings located on the corner of Alanbrooke Road at 38 Montgomery Road were later occupied by Shorts Missiles and currently Lisclare nursing equipment. 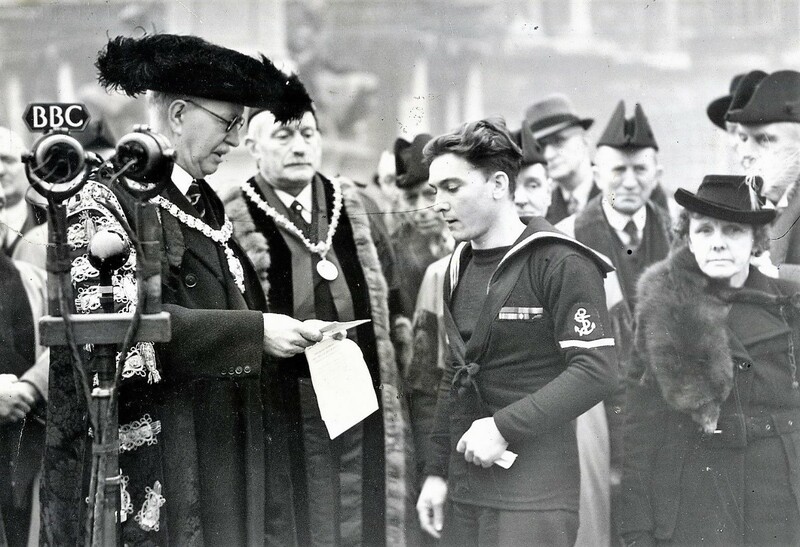 James Magennis was the only native of Northern Ireland to receive the highest award for valour, the Victoria Cross, during the Second World War in an action involving a midget submarine attack on the Japanese cruiser Takao. He is pictured with the Lord Mayor of Belfast, Sir Crawford McCullagh, at a civic reception on 19th January 1946. He died in 1986 and his VC was sold at auction to Baron Michael Ashcroft for £29,000. In 1998 Castlereagh Borough Council erected a memorial plaque on the wall of James Magennis’s former home at 32 Carncaver Road, Clonduff. 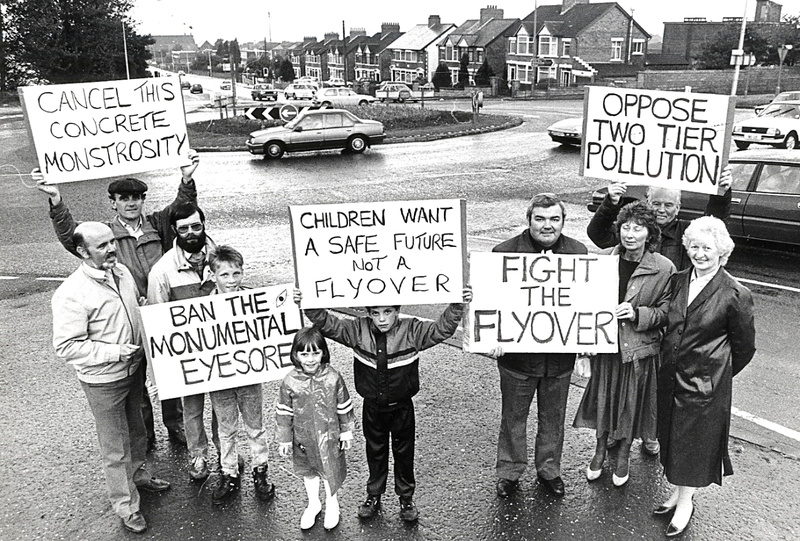 There was a proposal for the construction of a flyover at the Castlereagh roundabout in 1988. However a committee of local residents was formed to successfully resist the plans. Although there are only ten people protesting a note on the back of this photograph honestly records that ‘due to the heavy build-up of traffic the main protesters, nearly 600, had dispersed and gone home so this is not a true picture of the protest’. The plans for a flyover did not go ahead. A blacksmith ran a business not far away from Castlereagh Gospel Hall on the corner of Church Road and he was called James Corry. 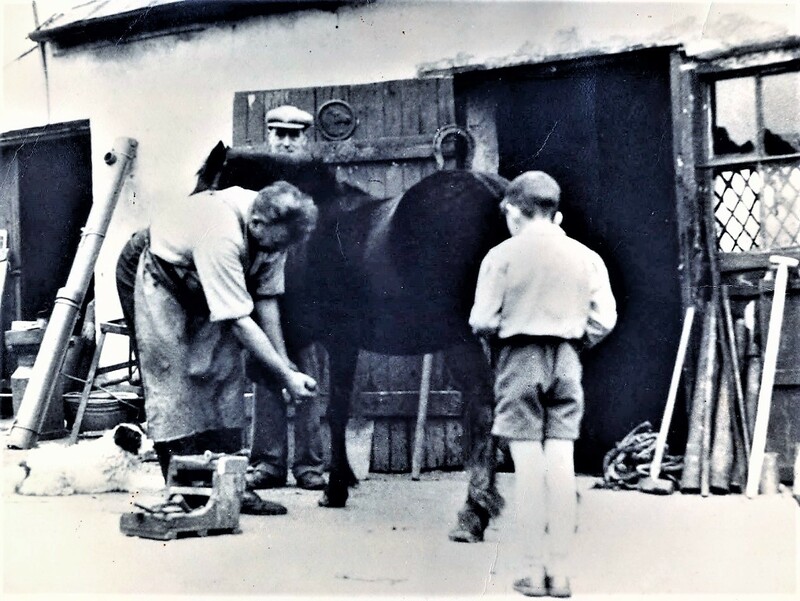 Here he is at work shoeing a horse. You can see his wee terrier dog ‘Toby’ and Austin Nicolls is the young lad with his back to the camera looking on in this 1950 scene. Corry’s also had a shop which sold oil for lamps, sweets, lemonade, cakes and bread. By 1960 the Belfast Street Directory describes James Corry as a ‘confectioner and tobacconist’ so presumably the blacksmith business had closed. 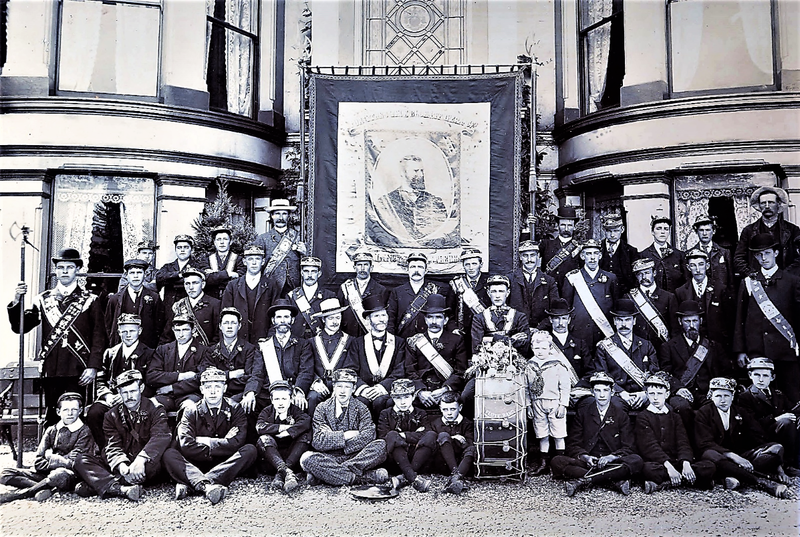 It is 12th July 1904 and John Forsythe is pictured at Castlereagh House on Manse Road sitting six from the left in the second row. The Lodge is LOL744 Forsythe’s True Blues Temperance which was named after him. A much simpler building originally, Castlereagh House (now demolished) was renovated and turned into a grand family home by John Forsythe with castle-style battlements, bay windows and a flag pole on the roof. It was situated in large private gardens and on ground now occupied by the SONI electricity office complex at 12 Manse Road which is known as ‘Castlereagh House Control Centre’.